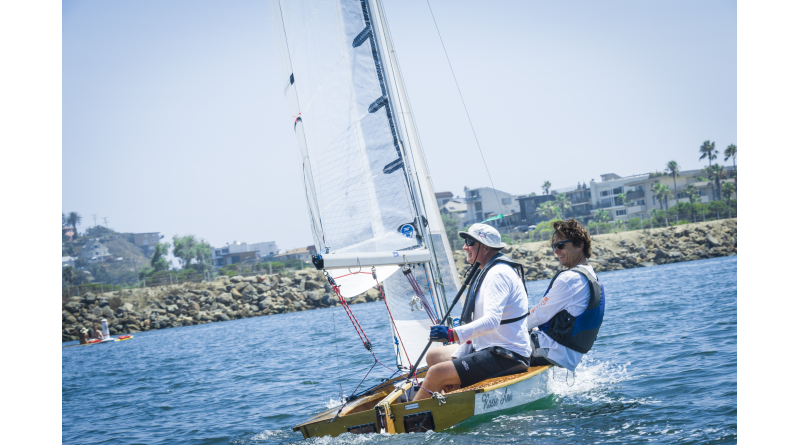 MARINA DEL REY — A solid field of five crews turned out for the Wooden Dinghy Regatta in Marina del Rey Harbor where the one design fleet of snipes did well in the light breeze. Notably, the age of boats ranged from the 30s, to current times. Snipe 3244 was the oldest, built by Douglas Aircraft Snipe Builders in Santa Monica in 1939; and only one of two boats still surviving from the Douglas Aircraft Snipe Builders, according to race organizers. The Sonatina Scow was the newest boat in the race, built only a few years ago by her current owner, with new modern rigging and sails. The other boats in the race where built in the ’50s and ’60s and have mostly original and period correct rigging. The non-one design, Sharphie sailed a shortened course and was the only representative of the class. Race results are as follows: 1st: Snipe #14279 Katawampus took line honors overall and in the class; 2nd: the Sonatina Scow, Rosie Ann #8; 3rd: Snipe # 12162 Apsara; 4th: Snipe #3244 Good for Now. Snipe Class: 1st: Katawampus; 2nd: Apsara; 3rd: Good For Now.